11th January 2019 - Only a couple of days to go and the weather is looking ok - bit windy but only a little rain (which may affect visibility!). I'm sorting the prizes out now and would like to thank our generous sponsors of MyRaceKit, Bradfield Brewery, Howard Town Brewery for prizes of vouchers and beer. Black Hill / Sliddens. This map shows the three points on the Pennine Way and the three stiles. For 2019 you must use PW3 to Stile A - This is NOT FLAGGED and so make your own way across the moors between the two points. Everyone was sent an email to the address they supplied to Brent when they entered. So if you didn't get the email check your Spam box and also make sure Brent has your correct email. Other than that and the implementation of the NO GPS rule everything else remains the same and on course for an 8.30am Start from Marsden on Sunday 13th January 2019! 15th January - The saying on the day was "Well it was much better than last year". So thank you to everyone for coming back and tackling it again after the horrid weather of last year. It was a brilliant day and I'm still buzzing with tired legs after it all. I'll write up a proper report this week but firstly thanks to Woodhead Mountain Rescue who organise all the checkpoints and the catering, to Charmian Heaton for taking on the RO job, for all her helpers from Retford for manning the Finish, to the landowners; Yorkshire Water, United Utilities and National Trust for letting us run across their land, Marsden Cricket Club for the Start and Fieldhead Campsite for the Finish (and showers!). For prizes we call upon the generousity of the Huntsman, Bradfield Brewery, the Trunce and MyRaceKit. Cakes made by me! Thank you to all the runners. We raise a lot of money for Woodhead Mountain Rescue and they are very grateful. If anyone has any race reports / blogs, or / and photos I would love to see them / or put links to them as in previous years. 8th January 2018 - the final list of Entries is up now. Points to note about the Route.. Both the Pennine Way and the Stile will be marked on the day. You can use any route between those two points. 2) After the Crowden CP when you leaving the Trans Pennine Trail onto the Access Land you must either use a stile, woodern crossing or a gate. Runners seen climbing walls or fences will be disqualified. Be warned ... Charmian will be watching! 17th September 2017- The date of 2018 race is January 14th. We have started getting access permissions for the race and hope to have the Entry Form up by the end of September so keep checking back here. 3rd January - Black Hill / Sliddens. This map shows the three points on the Pennine Way and the three stiles. 30th December - Sorry about the lack of updates but I've been in Australia for three weeks. As you're probably aware the race is full and to help us organise and do catering it would be very helpful if people who cannot now run could let either Brent or myself know. I'll be putting a new entry list up as soon as Brent sends it through !! 1st November - Entries rolling in - so get's one in if you want to enter! We've been dealing with access permissions too and have updated the CP's accordingly. The campsite will be closed but we can still use it; without the use of the showers though. We'll have an extra "Ladies Tent" at the Finish so the blokes can use the big tent and we'll find a heated one to get changed in ! 11th January - just a short post to say thanks to all the 201 runners that braved the weather at Marsden and ran to glorious weather in Edale. What a contrast! Thanks to Woodhead Mountain Rescue for manning all the Checkpoints and standing on the hills inbetween. And also to WMRT Supporters Group for providing all the wonderful food. I have a selection of lost property - so get in touch if you've lost anything. But also if anyone found a Garmin on route it's Ian Heginbotham's. 1) The Start is 8.30am. Registration will open at 7.15 am and close at 8.15am. Full waterproof jacket and bottoms (with taped seams), long sleeved top, suitable footwear, torch (head or hand held), emergency bag or blanket, hat and gloves, map (the Dark Peak map which just excludes Marsden is acceptable) compass (Sliva type) , whistle and some emergency food is the minimum kit. Can anybody not able to run please email me on Nicky@MarsdentoEdale.co.uk Many thanks. 16th December - Lots happening behind the scenes. 1) The Trunce has kindly bought a Gala Tent for use on the Trigger and so you'll have a nice new tent to change in at the finish. 2) Pre race refreshments will be available from Marsden Cricket Club - however these aren't free and you should bring some small change if you wish to have some. 3) Bag drop - there will be baggage labels in Marsden Cricket club - write your number on the label and then tie it to your bag before putting it in the cattle trailer which is parked outside the club. 4) Post race refreshments - we will be issuing tickets at the Finish for "Runners food". There will be tea and cakes on sale for supporters and family but we must make sure that there is food for all the runners and the marshalls. 6th December - the race is now full so I have removed the Entry Form off the website. WMRT Supporters group are planning the hot food and have asked that we hand out tokens at the finish so that they can monitor food and make sure everyone gets some! 14th November - We now have 180 entries and I have sent confirmations out yesterday. About 5 emails bounced back so if you are on the list and haven't had an email then please email me your correct email address. 2nd November - I have updated the Entry list page and sent Confirmations out to everyone on that list. It's about two weeks old now; Brent probably has entries he hasn't processed yet so don't worry if you aren't there but have only just sent your entry off. 3rd October - Entries have only been open two weeks and we've had 80 so far. Myself and Woodhead Mountain Rescue wish to give a big thanks for all the donations which have been added to the race entry fee - these have boosted the current amount raised to £1200. I'll get the Confirmations and Entry list up soon. 20th September 2015 - I've put the Entry form up on the Details page (please read before entering). Richard Hopkinson approached me earlier this year and was asking about the the whereabouts of the trophy he had made in memory of his wife Dawn; a good friend of mine. He would like to find the trophy and donate to the Trigger Race as Tankies is no longer running. If anyone has seen or knows where it is could they please let me know. It is a lovely trophy and deserves to be presented year after year in memory of Dawn. This is a photo of me with the trophy. Many thanks. 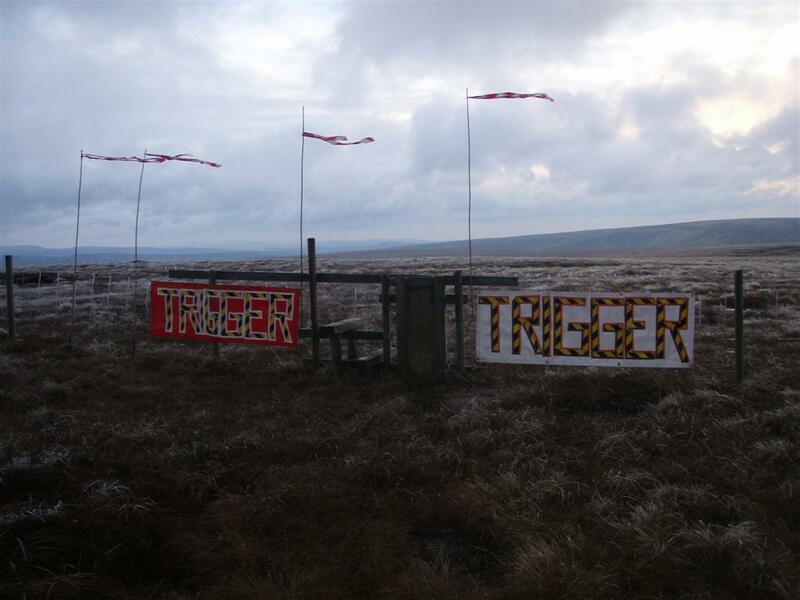 20th August 2015 - The date for the 2016 Trigger Race is 10th January. I'll be posting details and an entry form up on this website in September. 12th January - Many thanks to all 198 runners that ran yesterday. We had a very successful race which was a huge relief after the dire weather forecasts in the week leading upto the race which makes organising a nightmare. The altered course and the weather conditions - wet underfoot and a howling wind made for slower times overall however Neil Northrop won in a time of 3.36.06 with Adam Perry close on his heels in 3.37.55. 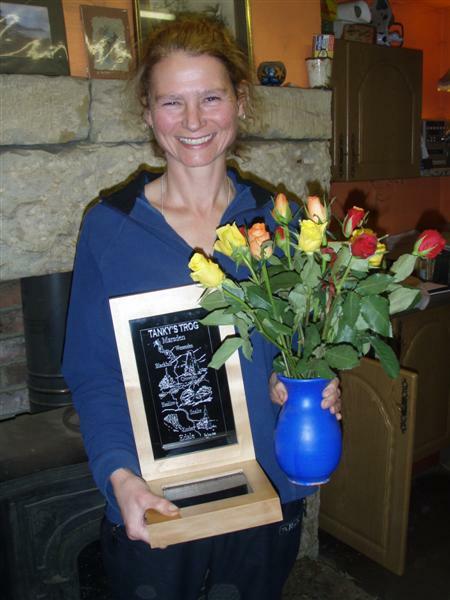 1st Lady was Jasmin Paris (7th overall) in a time of 3.51.30. I've put the results up and will write a longer report later in the week. Thank you to Woodhead Mountain Rescue who provide manpower for all the checkpoints and the catering. Bernice and Charmian who stood for 8.30 hours on the Finish line. Steve (my husband) and Andy Heading for their bag drop work and Steve also for his work on access which although seems to be diminishing we are making progress especially across Black Hill. We do have to work with National Trust. Do not complain to me about the Mill Hill flags as I hate them more than most as can be seen by my loss of 12 places on them !!!!! Thanks also to Andy Plummer for his work on the day doing the results and also for his donation of wine. Bradfield Brewery donate the beer and www.MyRaceKit.com donate the kit prizes. As I'm sure you will have noticed the weather now and forecasted is foul. High winds, very cold and raining (maybe snow). 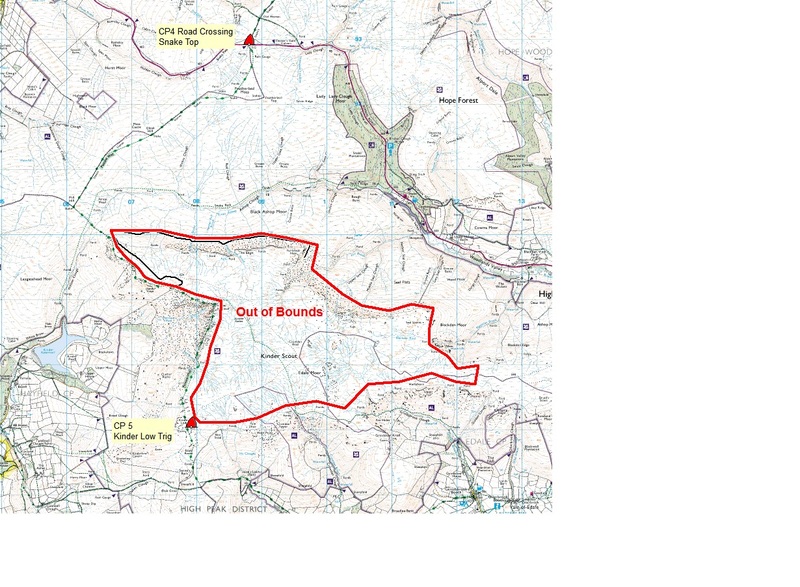 Having said that Woodhead Mountain Rescue will only cancel if they cannot get a vehicle to Crowden, Snake Top or Edale. At the moment the weather prediction for snow and/or ice is unlikely to result in local road closures. Full waterproof jacket and bottoms (with taped seams), long sleeved top, torch (head or hand held), emergency bag or blanket, hat and gloves, map (the Dark Peak map which just excludes Marsden is acceptable) compass, whistle and some emergency food is the minimum kit. 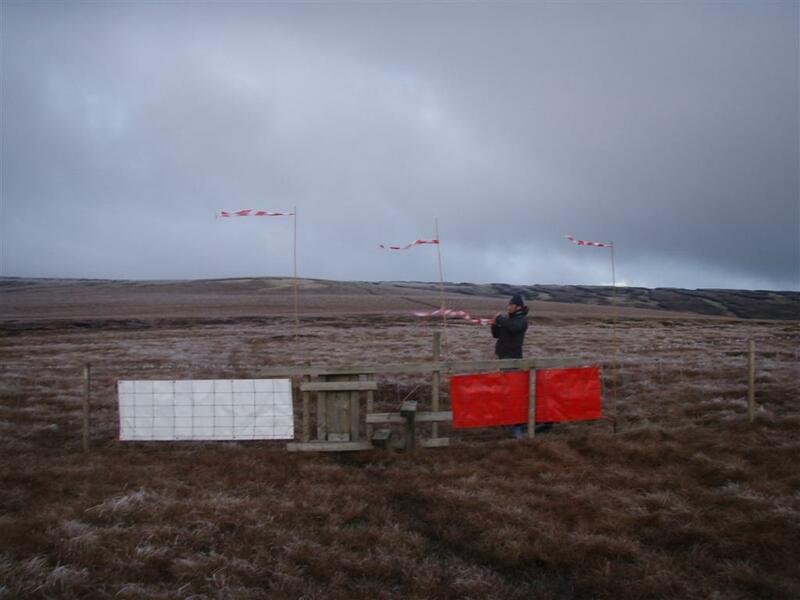 4) Kinder Plateau - we are not allowed to send runners over the plateau. I am really sorry about this as I hate the flags/path as much as anyone but National Trust have been told by Natural England and they / we must comply. So as well as CP 5 we are putting another CP. From here you can run round the edge to Grindslow or drop into the valley along the PW. The Finish is Edale campsite as before. 6) At the Finish we will be taking the physical numbers off your chest. If you want them please fill out an envelope with your address and Race No and I'll post them back to you. We have had countless enquiries about last minute places; there are none. We ask that these people do not run without numbers and remind everybody that the FRA bans such runners. We will assist the FRA by photographing and naming anyone we see running unofficially. That's it. Please dress according to the weather and your needs. It is going to be very windy, very cold along with rain / sleet / hail. 16th Dec - I've sent an email out to all runners; if you haven't received it; then we probably haven't got your correct email and could you let us know it. 1) United Utilities have agreed for Black Hill / Sliddens / Crowden route that we can use EXIT POINT PW2 (at the end of the flags as you leave Black Hill) to STILE B (in the middle of the fence- ie the original route). 2) National Trust have said that Natural England are putting pressure on them to keep people off the Kinder Plateau until the restoration has taken firm hold whereby we will be allowed to run the route where we like - hopefully in 2016 or 2017. So we have been asked to send runners along the Pennine Way to Kinder Low Trig area where they can then have a choice of running along the edge path, via Crowden Tower / Grindslow OR continuing along the Pennine Way down into Barber Booth and along to Edale in the valley. Steve has asked National Trust for permission to run the original route - IF on the day there is a HARD FROST. So please take that into account when reccying / marking up maps etc. If we have to use the PW - there will be another CP - probably at KINDER LOW TRIG as it's an obvious fixed object. PS I'll be sending out a reminder a few days before the race of the kit requirements / start time and would hopefully be able to give you an indication of which route you'll be taking across Kinder then. 9th December - There's been no news as race organisation is going to plan. I'll send out an email a few days before the race reminding runners of the NEW START TIME and the NEW KIT REQUIREMENTS. Many thanks to Colin and Elisabet at www.MyRaceKit.com for donating a huge load of kit as prizes and for getting the numbers printed again. I hope the training is going well ..... If not or you have picked up an injury / flu/ other commitment .... then can you please let me know as we have a long Reserve List of people waiting eagerly to be allocated a place. We also really appreciate knowing exactly how many runners we'll have on the day to calculate catering etc. 2) The cost is now £12 (with an option of a voluntary donation to WMRT and Gift Aid) and Simon's address has changed - it's on the Entry form. 3) The Cutoff's have been brought back 30 minutes (in line with the Start time) so Crowden is 11.30am and the Snake Road is 13.30 hrs. 4) We have added 3 items to the Compulsory Kit List i.e a long sleeved top, a head torch and an Emergency bag or blanket (this can be either foil or plastic). That's it - now get your Entry in ....!!!!! 5th September 2014 - I'm hoping to put the Entry form up in September once we have finalised the details. Check back soon. Mean while I have revamped the website as it was a bit messy. Hope you think it's an improvement. 16th Jan - the Results are up and my Write up is here! Thank you for all the emails and comments of thanks. It makes all the hard work worthwhile. I really like the one below from Marcus! Another year and another well organised Trigger race. A toughy as usual, especially with the awful conditions on Kinder. Please pass on thanks to those brave souls at the marshalling points who in spite of the conditions had only encouraging words for the racers. It was cold running so I can only imagine what it was like for the marshals - especially the three at check point 5 who loomed out of the fog and wind like ghosts! Thanks again for a fantastic if gruelling event. 13th January - many thanks to everyone for making it another successful day. I'll get a report and the full results up shortly. For the time being this is the list of Prize winners . 1) Black Hill / Sliddens. As per last year we have had lengthy discussions with United Utilities about access from Black Hill. Due to RSPB sphagnum trials in Sliddens Moss and the recent wet weather it has been decided to use PW3 TO STILE A OR B (Runners can choose which stile they wish to cross). For those runners who ran the race last year we used PW2 to STILE A. So when you leave the Black Hill CP you must continue down the Pennine Way until you see the BLUE ARROW. Then make your way across to either STILE A or B. The stiles will be obviously marked. 2) The Kinder checkpoint will be on the edge path/stile junction (SK 068 898). In clag the stile will be easier to locate than the rocks at 600m - as you can see there are many rocks in the area. 3) Remember your cakes and kit - Full waterproofs (not pertex), hat, gloves, map, compass, whistle, food. 1) Once again we are requesting donations of CAKES to be brought to the Start if possible. These will be served at the Start and Finish to all runners and also to family / friends for a donation to WMRT. 2) Please be aware that because of the new FRA rules Registration, Kit Check and the Finish will take longer. Please be patient and arrive early at the start and be aware at the Finish that we will be removing your race number so don't leave the Finish area with it. 4) Thank you to everybody who added a donation to WMRT on their Entry Form. Simon is adding the total up and I will let you know this figure. 25th Nov 2013 - To avoid confusion Steve met with Shane (from National Trust) today and decided an Out of Bounds Area. The new checkpoint on Kinder is the same at SK 068 898 as shown on the map. 20th Nov - The race is nearly full so anyone wanting a place get your entries in now. We'll operate a Reserve List after that so if anyone knows they cannot run please can they let me know. There has been questions asked about CP5 - where can you go when you leave the CP. Steve is hoping to finalise this next week but we do know that you won't be allowed inside the fence onto the plateau. In 2012 and 2013 the National Trust have been very accommodating in letting us use the Kinder West Trig while initial restoration work has been carried out. For 2014 Shane Bates has asked us not to run over the watershed saying that "The main reason for asking you to divert is that we have been doing some innovative work in that area and towards Kinder Downfall to try to establish Sphagnum moss back on the bog ultimately to promote natural formation of the peat bog which will then repair itself without human intervention. This has involved spreading small moss propagules encased in gel. If we can limit trampling as much as possible these should establish much quicker." 2nd Nov - I've held off sending out confirmation because we will need to move the Kinder West Trig (not physically) checkpoint this year and are awaiting confirmation that the location we chose is acceptable to National Trust. As everyone has seen there has been a lot of restoration work done around the trig point over the last two years and the time has come for some trials to be undertaken. The new location won't be more than 500m to the west of the trig and we should know very shortly of the actual location / grid reference. If we find that someone has run under someone else's number we will report them both to the FRA. It is completely irresponsible and goes against all our safety precautions. If on the race that "Ghost Runner" went missing we have no personal information or contact numbers for them. I would ask everyone to name and shame such runners. 16th September 2013 - I have just put the Entry form up in the Details page. 26th January - I forgot to update with the amount that we raised for Woodhead Mountain Rescue which is £2782. Thanks very much for all the entries and donations. I've put my report up here and updated the Prize list but there is nothing changed from the results - it just makes the Category winners easier to find! 13th January - Massive thanks to everybody - Amanda and Andrew of Racekit, Woodhead Mountain Rescue, Pete Sparks and all the landowners and hall owners. And very importantly to all the runners who did go over the stile - from what I hear that was everybody and it will really help the race in future years to be able to say that runners do want to help the restoration as much as anybody and we can direct them away from sensitive areas. Well done to all 175 runners (one retirement) who completed today. 12th January - we have just been and marked the stile up. We have also put a Blue road arrow on the brow of the hill. If you leave the path where the arrow is and run down the patch of grass (just visible behind the far left marker in the right hand photo) you come across a trod that leads you round to the right of the bogs/tussocks and then to the stile. It's far better than leaving the path later on as the further east you are the more tussocks there are. 10th January 2013 - Due to the very wet weather we have been having recently we have agreed with United Utilities that we will make a minor change to the route across Sliddens Moss (which is on route from Black Hill to Crowden) in order to reduce the footfall. As No 2 of the Details page - On leaving Black Hill Trig checkpoint follow the Pennine Way until the marker flag (just before pond). Descend as normal from there. On reaching the fence which crosses Sliddens Moss you must cross using the stile at SE 073 035. This is slightly west (75m) of the usual stile/crossing point. The stile will be well marked so there will be no excuses for using the old one. After crossing the stile you are free to choose your route into Crowden. c) Try and avoid the areas that have been cut by the RSPB and marked out with small pegs. If you intended to descend to Crowden via the Pennine Way this information does not concern you. Many thanks. PS Please bake / bring cakes. Weather looking very good but cold! See you Sunday! 18th December - We've had a number of people who cannot run the race and have very helpfully contacted me to tell me. This has allowed us to accept more runner from the Reserve list onto the Entry List. As well as the Fellrunner Forum we have set up a Facebook page so that people can discuss route options / carshare etc. The conditions this year seem to be good for reccying so will undoubtedly be foul on the day. Regarding the Kit List there will be a board at Registration informing runners of the Kit we require. As there is a bag drop so spare kit can be transported to Edale there will be no excuse for not having the right kit. a) If you have travelled with friends then it's them. b) If you have travelled with your family then it's then them. c) If travelled alone and your family / friends are at home then it's them. Take your form and collect your number. You're ready to run .......enjoy ! 15th January - Post Race !!! What a fantastic day; I couldn't help smiling as I ran out of Marsden. It was actually happening and to top it all the weather was stunning. 1) Results are up ... 2012 Results. The Prize list is here. I have prizes for LV60 Lady winner; Hazel Winder and the 1st Ladies Team; Glossopdale and the 2nd Ladies Team;Macclesfield I'll contact you to arrange delivery! a) Amanda and Andrew Heading of Racekit who have been around all day doing the jobs no-one else thought about. And donated a pair of Buffalo Mitts to all category winners. Andy Heading has taken photos and will be putting a report together for the Fellrunner. b) Mark Reeves of Fieldhead Campsite for donating tarps yesterday when we discovered the marquee had no roof and today for letting us take over his carpark and campsite. The showers were brilliant by the way. e) Teresa Wall for donning a rather fetching fluorescent jacket and along with Amanda and Steve spending most of the day directing runners into the finish. e) All the guys at WMRT for taking the huge job of checkpoint manning off my hands and doing a fantastic job of it. And last but not least - you the runners themselves. 169 Registered and with only 3 retirements the rest capably navigated themselves from Marsden to Edale. Thank you for not getting lost! And also for the large donation of cakes that we received. I think they raised £100 for WRMT. Richard Askwith took a lot of photos on the flags out of Marsden - http://www.flamingphotography.co.uk - The Trigger; Marsden to Edale I will be putting together a gallery so if anyone else has some photos or a link let me know and I will add them to the Gallery page. 10th January - There have been a few enquires about the map coverage required as the OS Explorer Dark Peak map just misses off Marsden. WRMT have decided that the OS map will pass Kit Check as the route from Marsden to Wessenden is on a very good track and path. Ian Winterburn has also asked that if you are using cut down maps to make sure that grid refs can still be determined in case of rescue. Food - to claim your food please keep your number and hand it over in Edale Village Hall. 1) The race is full which is marvellous for its first year see the Entry list for the full list of runners. 2) Bradfield Brewery have donated 2 cases of Farmers Pale so there will be lots to go round as prizes. 3) The weather is looking favourable - or rather it's not snowing! 14th December - Trophies on display at the Huntsman. While looking at the sitemeter I noticed referrals from http://www.bench-marks.org.uk/bm40532 and http://www.bench-marks.org.uk/bm40531 . Last night we were talking in the pub over a pint of Fellrunner or two about how the numbers correspond to trig's and how they are recorded !! This answers all our questions. 13th December - the trophies were collected yesterday and are brilliant. Thanks to Andy Plummer who has donated profits from the Trunce to pay for them. The trophies will be on display from Tuesday 13th December until race day in the The Huntsman at Thurlstone ! a) As the Snake has technically been "shut" this week after an insignificant amount of snow we have decided that in the case of similar conditions prior to the 15th January that WMRT will drive out on Saturday 14th Jan and assess the road themselves. If it is possible for them to get the team to the checkpoints and top of the Snake then the race will still go ahead.